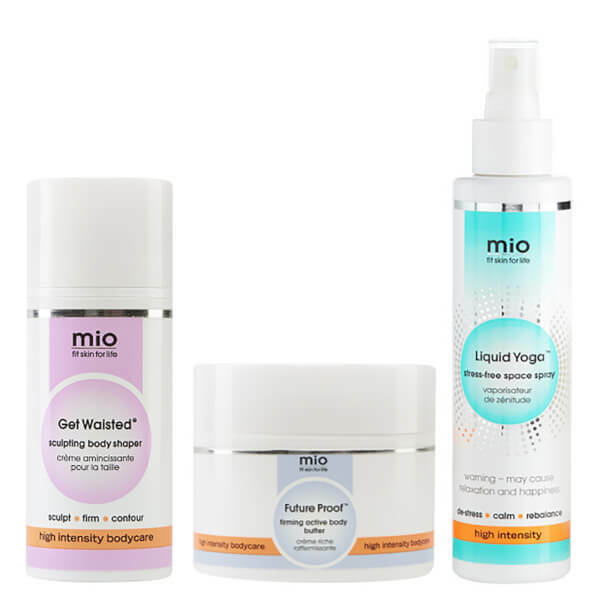 Transform your skin with the Mio Skincare Month of Mio Faves Bundle, a trio of ultra-nourishing treats to smooth, firm and brighten the body contours from top to toe. Free from parabens, colourants and phthalates. Cruelty-free and vegan. Fortified with a host of beneficial ingredients, including pharmaceutical grade Caffeine, renowned for its firming effects, the body cream intensely moisturises to promote smoother-looking skin, and utilises visible firming actives to lend the appearance of tauter skin. Combined with a healthy diet and regular exercise, the sculpting cream can help to improve and firm the look of your tummy. If you’re a butter lover, Future Proof is the product for you. Super nourishing for dry skin, it leaves your skin feeling supple with a radiant glow. Packed with antioxidants as well as vitamins, it’s a gift to your skin that just keeps on giving. A spirit-lifting spritz infused with a cocktail of essential oils to calm, de-stress and rebalance the mind. Infused with a blend of essential oils, the calming spray provides rapid stress relief and enhances feelings of hope and well-being whilst eradicating feelings of anxiety and nervous fatigue to boost self-esteem and mental strength. Tension headaches are soothed and peace of mind is reached.